The sprawling British greenwood was once the home of a mysterious silent stalker believed to be a secret-keeper of the forest, a feline caterwauler whose call would ring eerily through the depths of the woods. But the Eurasian lynx (Lynx lynx) has now long been missing from the British landscape, which has been empty of this beautiful predator for over 1000 years. The latest fossil records date lynx remains found in Yorkshire to around 1500 years ago, around which time they were hunted into extinction for their pelts. Lynx used to roam the globe from the UK to China, and, like many species lost to Britain, small populations of lynx have managed to linger on in Europe in scattered, small populations. Lynx have been successfully introduced to parts of Europe, including northern Germany, where a population of 100 lynx now live after 14 were released in 2000. Roe deer will make up their primary diet if available, making lynx an excellent apex predator for environments with high density of roe deer. This is good news for the ecosystem, as control of deer populations help to maintain a mosaic of habitats and increases biodiversity. Where deer is scarce, lynx will eat smaller mammals, such as foxes. None would escape but that had strong wings. The folkloric memory is long, and this traditional song possibly remembers when lynx lived freely in our forests, taking their rightful place as part of our culture, as one day perhaps they will do so again. Mainly crepuscular (active at dawn and dusk), solitary creatures, lynx come together and breed around February and March, so that their young can be strong in time for winter. Lynx will have their young in a secluded den, lined with grasses, feathers and fur. One to four kittens will be born in April or May, and will be independent within ten months. Lynx vary in their appearance, are between 80 to 130cm long and 70cm at the shoulder, weigh between 18 and 40kg, and can live for up to 20 years. Depending on their location, lynx range from a reddish brown to a silvery grey, with large, dinner plate-like paws that enable them to hunt well in snowy conditions. Their intelligent, feline faces are framed by a distinctive ruff of hair, and they have short, usually black tipped tails, and ears tufted with black hair that help give them their keen sense of hearing. 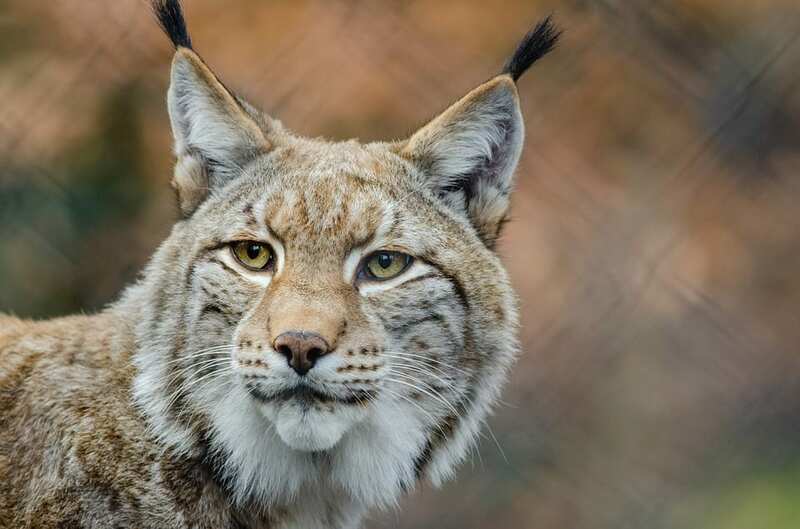 There is potential for bringing back lynx to Britain, though it would not be suitable in areas where livestock farming predominates and where their natural prey is scarce. Perhaps the Weald of south-east England would be a suitable area: it is well wooded with very high numbers of roe deer and relatively low presence of livestock. Lynx pose no threat to humans. Lynx UK Trust is the main charity promoting reintroduction of lynx to Britain.